A new toddler title charts a crucial achievement. (Ages 1-3) There comes a point in a toddler's life when going in one's diaper is only one possible option, and the question must be raised: Should I go in my potty? With pitch-perfect humor and pacing, Leslie Patricelli follows the inner dialogue (sure to have little ones shouting responses) and hilarious actions of everyone's favorite Baby, winding up with an over-the-top look of surprise and delight that will have both parents and offspring laughing out loud. "I did it!" --The Horn Book A cheerful declaration of independence, this refreshing treatment allows toddlers to imagine a successful future. Parents will know it's not that easy, but they will enjoy the humor that accompanies this heaping helping of positive reinforcement. --Bulletin of the Center for Children's Books These appealing books feature simple text, bright acrylic illustrations, and everyday situations that are certain to engage the very young. 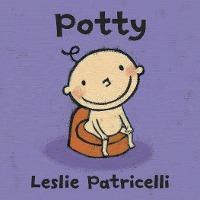 Leslie Patricelli is the creator of a series of best-selling board books starring her adorable bald baby. She is also the author-illustrator of two picture books about the Patterson Puppies as well as HIGHER! HIGHER!, a BOSTON GLOBE-HORN BOOK Honor winner. She lives in Ketchum, Idaho.